Mexico, just like we remembered it, dusty, “different” smells than the US, inefficient, great food at great prices, fiestas, wonderful. We crossed the border early one morning from Nogales, a city in Arizona that straddles the border, part in the US and most in Mexico. In Nogales, it already feels like you are in Mexico even in the US side and Spanish does seem like the dominant language. We were befuddled by the border and found ourselves doing things differently than we intended. We had planned to declare our boat goods and pay duty on them, but, the combination of the early hour and the border crossing that made it easier to go through the “Nothing to Declare” line rather than the “Declare” line, led us to go through before we knew it and, luckily, get the green light. We passed through, then looked at each other and said, “Is that it?”, but there we were in Mexico—noisy, full of traffic and people and dogs all over the streets. Of course, that wasn’t it, which we kind of knew, but never having done it before, we constantly allowed ourselves to be surprised. We knew there was another stop at “Kilometer 21” (which isn’t at Km 21 so nobody knows why it’s called that) and we thought we were going to get our auto permit there (which it turned out we didn’t need for the state of Sonora—our destination—how come everybody else knew that and we didn’t? even after a web search—oh well, heavy sigh). However, it was a full fledged customs stop again and, once again, in our confusion we went through the “Nothing to Declare” line and got the green light. We are as stupid as we sound in this case, but, all’s well that ends well. Since we paid some bucks for a car permit we don’t need and didn’t pay duty, we figure the government came out about even. 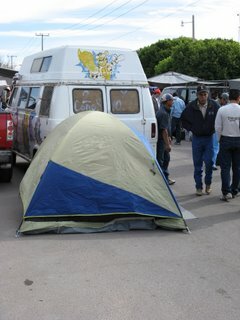 So, in conversations with the many others down here in San Carlos, those who know what they are doing and those who are first timers like us, the process is mucho confusing to everyone and, depending on the official present at the moment you cross the border, might be handled differently from day to day. We drove the remaining 5 hours to San Carlos where our boat was “moored” on land and found ourselves an “apartment” for a week or so while the boat was in the yard. Then we went to the boat, with our hearts pounding, and found her in reasonable shape. Phew, big relief. There was some water in the bilge (which is not supposed to be there and we found at least one leak), but, overall, all the systems are still working and she’s in fine shape. While we were looking over the boat our first day, Richard was in the cockpit while I was below and he asked, “What kind of spider is it again that’s black and has the red hourglass on its belly?” I was in the cockpit in a panic to observe a Black Widow spider who had taken up residence between the jerry cans left in the cockpit. She was beautiful and we were both transfixed by her looks briefly whereupon we came to our senses. Just as Richard was about to kill her, a mosquito landed in her web and, for a second, we hesitated to put her out of our misery because, after all, there were a lot of mosquitoes and she might come in handy. Then she was euthanized. We haven’t met any other stowaways. The boat, after an excruciating, dusty, mosquito filled week plus in the boat yard is now back in the water, floating happily and her crew is much happier by far. Meanwhile, we have gotten our cruiser mindset back if not our sea legs yet. A whole day can go by and we might get a couple things done, but basically we can fritter away hours comparing notes with other cruisers and then decide that, well, it’s lunch time, let’s go get some lunch, and then, well, after you’re done with lunch and talking, it’s time for siesta, and then, well, it’s really close to happy hour and you’re supposed to visit someone else, and then, well, it’s dark at 5:30, too dark to work on the boat. The boat is repaired, painted, our stuff is packed away, the boat is re-rigged, lines and sails back on and a couple projects are done. It’s all taken days longer than it could have, but we are enjoying living on the boat again and life is good. We’ve been exploring the area meanwhile. For the holiday “Revolucion” to commemorate the revolution of 1910, we took the bus downtown with another couple to watch the big parade. It went on for a few hours with floats, marching bands, sports demonstrations by all the various schools and youth groups as well as some groups dressed in “historic” garb from the revolution. 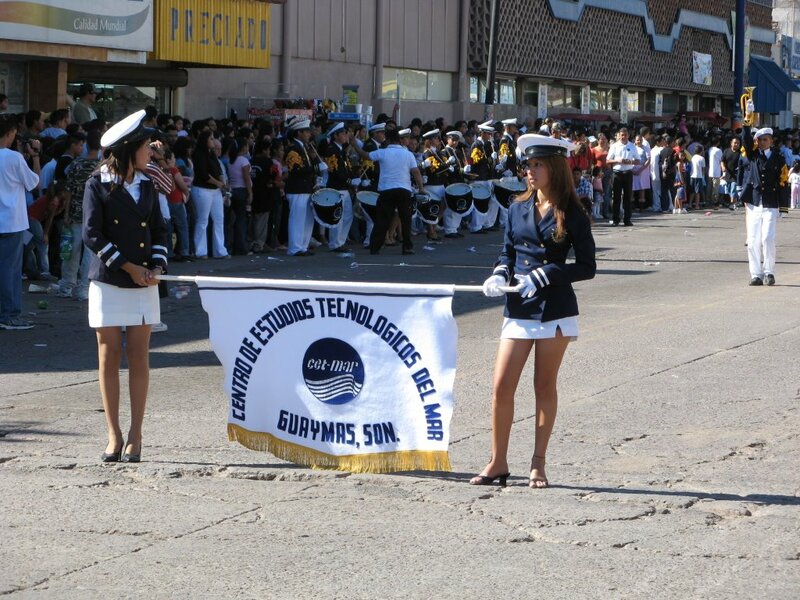 Every club was represented and the participants marched for a couple miles in 90 degree heat, stopping every half block while the group at the front did their presentations for the officials. As usual, the women involved wore impossibly high heels and, in this case, occasionally, impossibly short skirts! Also, many of the uniforms were wool suits in dark colors and there were a few MIA’s who dropped out from sunstroke. It was a great good time though. After the parade we ate Elotes, a treat we have seen but not tried before. It is corn-on-the-cob slathered in lime juice, margarine, mayonnaise and grated cheese topped with your choice of hot sauce. Needless to say, it’s practically a meal in itself. A couple days ago, we did something we never expected to do—went fishing! Our friend Garth is a most amazing and unique guy. He is currently building a salon table for our boat which is part of why we haven’t left here yet, and, among other skills, he happens to be a world class fisherman. He is invited to the world bill fishing championship in New Zealand each year and his team finished second last year. He loves to fish and wanted us to share his passion, so we agreed to see what it was all about. It didn’t hurt that he gave us a sample of his day’s catch the evening before we went and we had hours-old Sierra for dinner which was totally delicious. We left at 5:30 AM (!!) because “the bite is off by 8:30”. 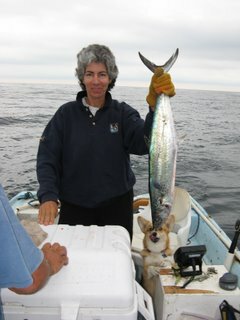 Garth and Vela, his absolutely adorable corgy dog, picked us up and off we went in his 20 foot panga.. It was just barely light when we caught our first fish. We each caught a sierra and I caught 2, the second being the biggest catch of the day. We also caught 3 skipjacks, the type of fish we caught on our way from Seattle to SF. Garth normally throws them back but he’s found that some of his Mexican friends really enjoy them. He won’t eat it to save his life and, well, having eaten it, we agree. As we brought a fish alongside the boat, we would grab it and pull it on board directly into a big ice chest. Inside the chest, the fish would flail around and then quiet down whereupon we would remove the hook, slice its gills and let it bleed out in the ice. When we were heading back in, Garth filleted the fish so that it was in ziplocks and ready to go by the time we pulled up to the dock. Now that’s fresh fish! Meanwhile, filleting fish attracts seagulls and pelicans and Vela (did we mention that she is his totally adorable corgy?) has been encouraged to bark at birds that might land on his boat (to discourage bird droppings—he always has the cleanest boat.) Well, she was barking like crazy at both the birds and the fish and it was quite a scene. We were done by 9:30 AM and went to a local restaurant with our fish where, for 20 pesos ($2), they cooked it and served it to us for breakfast complete with rice and veggies. It was the best fish we ever ate! We are even thinking of fishing from our boat again, hmmm, stay tuned. On the bad news side, a friend of ours was climbing down from her boat in the boatyard on her way to an appointment and was wearing “city” shoes. She missed a step, fell about 8 feet to the hard ground where she stayed calm while all hell broke loose around her trying to get medical care on site. The emergency response team was quite good (I know because I arrived seconds before they did and stayed with her the whole way), but she had a long and painful day transferring from the ground to the ambulance to the clinic bed to the ambulance, to the radiology table to the ambulance and finally to a hospital bed with very little pain medicine all while living with a fragmented fractured pelvis and, belatedly learned, a couple broken vertebrae. She was airlifted back to the US the following day. It was a reminder to us all to be exceedingly careful on ladders and around the boatyard. Latest word is that she is fine after surgery. For Thanksgiving, a bunch of our friends decided we should get together for a meal at Gringo Pete’s the place where a few of us had “apartments” (hotel rooms with kitchens). We all brought food and shared a lovely meal overlooking a gorgeous beach and toasted our good fortune to be living in sunny, 85 degree Mexico while our friends were shivering in 38 degree rain the same day in Seattle. Because our apartment or boat stoves were either unreliable or not very big, we decided roast chicken would do fine. Since you can go to Pollo Feliz (Happy Chicken) and get cooked whole chicken for 70 pesos ($7 and 2 for $12), we thought, why not? So a new tradition is born: cooked roasted chicken with all the fixins. We participated in a cruiser swap meet where everyone brings their boat parts and etc. that they no longer want/need and hope that someone else will want/need them. We brought a few things and, unbelievably, sold them quite early in the proceedings. We had a tent and 2 sleeping bags from our travels down here which we sold to a Mexican man who bargained us down a bit from our asking price. Still we were thrilled to see our things go away and get some money in exchange. The next day we went with friends (who have bought our van!) to a Mexican flea market about 20 miles away. There, we saw our Mexican amigo with our tent and sleeping bags trying to sell them there for, you guessed it, a very healthy mark-up. We shook his hand and all laughed at the coincidence. Bienvenidos a Mexico!! Suffice to say, we are enjoying Mexico again and have been happy to see a lot of friends from last season. Someday (soon?) 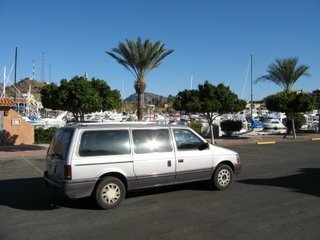 we will actually take our boat out of the marina and check out the systems aboard more fully, run our watermaker and start to get our sea legs so we can head across the Sea of Cortez to Baja, down to La Paz and continue south from there. We saw our van drive off the other day with its new owners and so begins the next chapter.